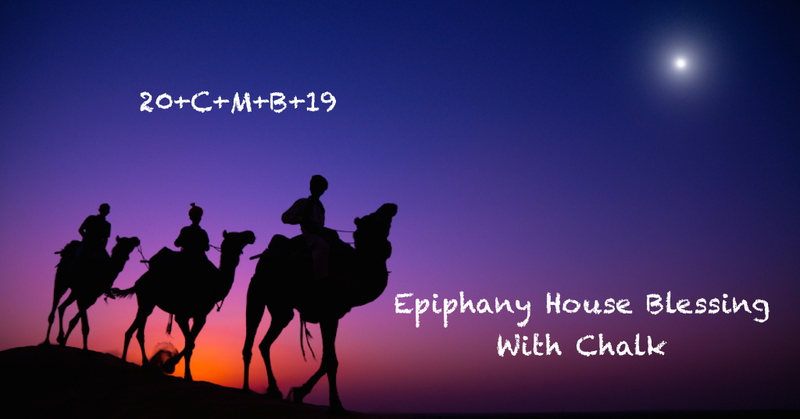 The Church has a custom of blessing homes on the Feast of the Epiphany (January 6) and the weeks following. Family and friends gather to ask God’s blessing on their homes and those who live in or visit the home. It is an invitation for Jesus to be a daily guest in our home, our comings and goings, our conversations, our work and play, our joys and sorrows. A traditional way of doing this is to use chalk blessed during the liturgy for the Feast of Epiphany and write above the home’s entryway, 20 + C + M + B + 19. The letters C, M, B have two meanings. They are the initials of the traditional names of the three magi: Caspar, Melchior, and Balthazar. They also abbreviate the Latin words Christus mansionem benedicat, “May Christ bless the house.” The “+” signs represent the cross and 2019 is the year. God’s Son who became human two thousand and nineteen years ago. May Christ bless our home and remain with us throughout the new year. Amen. “Chalking the door” is a way to celebrate and physically mark the occasion of the Epiphany and God’s blessing of our lives and home. With time the chalk will fade. As it does we let the meaning of the written symbols sink into the depths of our hearts and be manifest in our words and actions. Another Epiphany tradition is the Proclamation of Easter.Since the Epiphany is a fixed date feast (January 6) and also the last major fixed date feast before we enter the Easter cycle which is characterized by moveable dates, it was a convenient time to proclaim the date of Easter and other moveable feasts and fasts. Read the Epiphany Proclamation of Easter 2019.
i do not have chalk blessed from the liturgy of the Epihany —.I blessed the the chalk with holy water from Lourdes and said the pray you so kindly gave. I pray that all who enter are touched by the Savior ,our Lord , Jesus Christ. Can you send the chalk with Cyndy this weekend – never mind after this weekend – the sixth is Sunday – we are ready to bless our house! Epiphany blessings to you Leslie and you home. Deb, we have some chalk for you! I have the chalk that was blessed and I like more the way you at St Michael’s have explained what it symbolises and the blessed prayer go with it. I also like how you share the time of Epiphany in relation to Easter 🙏 Thank you. One question does the chalk have to have been blessed by the Priest or can anyone buy chalk and say the blessed Prayer full of Grace ? Yammen, God, not priests bless. Please say the prayers and bless your home. Glory be to God. And may we see His Glorious mercy and compassion in our life in this year 2019 in Jesus mighty Name. Epiphany blessings to you and yours. I had a large chalk blessed by a Priest several years ago and I keep it in my angel box so I can find it every year. God continues to bless me and my family and answers my prayers. He also keeps all of us safe from harm. I must admit, you have given the best explanation for why we do this every year. Blessed be God who continues to save souls. Epiphany blessings to you Joan. Plenty of Epiphany chalk for Catholic people at Saint Anthony Church SSPX in anti New Zealand…..Dneo Gratias ..